Lazy afternoons or on movie nights, who’s gonna deny we love the potato and its fries? Smothered with gooey cheese, or covered in glorious gravy, these places are keeping our fry-yayy feels alive. Just the thought of them fills our heart with dreamy happiness. Because Macazzo’s fries are to die for. Their oozy gorgeous bacon and cheese loaded fries are the answer to every bacon lover’s prayers. 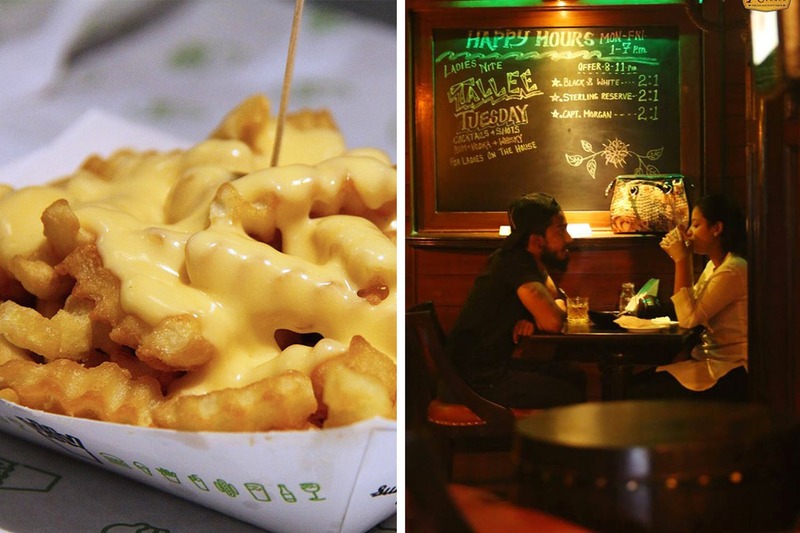 We can’t seem to get over our lust for their sinful pork-pulled bacon and cheese-loaded fries. Check here for more deets. With 31 different kinds of fries, Tall Blonde French is our new favourite in town. From cheese, chilli, chicken nuggets, beans and nachos—their fries comes along with every delish thing that you can possible imagine, and all under INR 160. If you are already drooling now, then go check here for more deets before you head out to grab ‘em. Another hot new fave. From tandoori chicken to pizza flavoured, The J has fries in all kinds of flavours. While we are completely binging on their Thai sweet chilli chicken fries, their chips n’ fish is also another flavour we can’t get enough of. And if the flavours don’t sit right your mood, then you can even go ahead and choose your own toppings. Awesome, right? Look here to know more. Chetty’s may not do your usual French fries, but who said we don’t like the desi with a hint of spice? Chetty’s Potato Twistatos has everyone in a tizzy with flavours from plain salted to chilli masala. We can’t help stuffing ourselves on the peri peri one. Look up here to know more. When oozy boozy thoughts of potent drinks and hot crispy fries come to mind, then there’s just one place we hit—the Xrong Place! Can it get any sweeter than sitting in this all-wooden pub near the Lake, sipping on a drink, tripping on good music and gorging on fries? Their potato wedges served with house spices and the cheesy French fries are the ones we love the most. This new joint in Alipore is another place that’s dishing up tasty fries in many different styles. The list of toppings seem endless with choices ranging from cheese corn poppers, nuggets, sausages and chicken popcorn. Best part, you can also pick your sauces and customise your nomnom fries just the way you like it. Go here to know more. Get your fingers greasy at Prince Anwar Shah’s 24/7 eatery Hondo’s which has excellent potato wedges and fries liberally tossed with their house spice. Have them by themselves or order as a side with their regular fare of humongously loaded burgers, sandwiches, and more.